The influential radical music group The Test Dept will launch a career retrospective anthology at Aston University next month. The book, Total State Machine, will reflect on the impact and importance of the band that formed in 1981 and made stridently political and socially conscious music until they disbanded in 1997. It will feature a series of reflections and evaluations by experts and aficionados of Test Dept, including Dr Stephen Mallinder, lead singer of seminal art-pop group, Cabaret Voltaire. As well as manifestos, excerpts from tour diaries and many previously unknown stories and documents, the book also contains hundreds of photos and pieces of artwork from the band’s archives. Test Dept were well known for their involvement in various political causes, particularly their support for the miner’s strike of 1984 during which they collaborated and went on tour with the South Wales Striking Miners Choir. The band are also seen as a pioneering industrial music act, using ‘found’ materials such as factory equipment and everyday objects as unconventional instruments to produce a uniquely jagged, metallic sound. 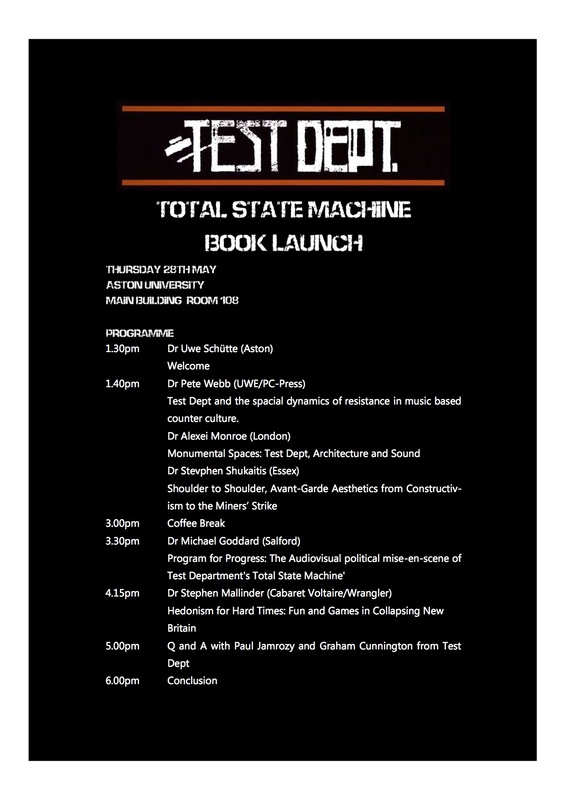 Many of the contributors to Total State Machine will speak at the launch event on 28 May, which will be opened by Aston academic and resident pop music expert, Dr Uwe Schütte. The event will be capped by a Q&A session with Test Dept founders Paul Jamrozy and Graham Cunnington. Test Dept’s impact on a variety of musical genres is well noted. Throughout the course of their career, they experimented with and influenced house music, break beat, industrial music, synth punk and electronic body music.